Anti Aging Detox Tea Drink! 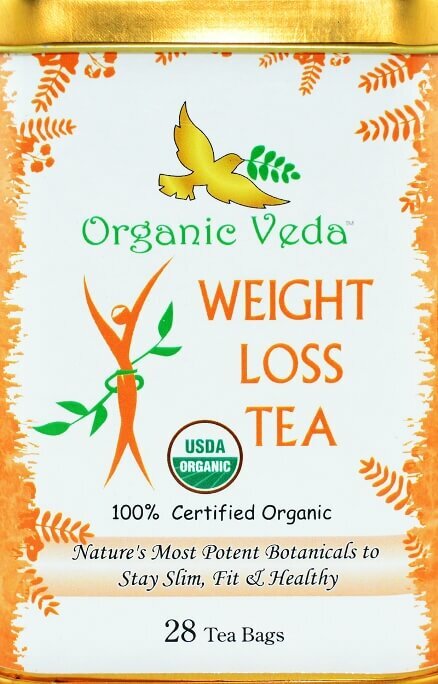 The Anti Aging Detox Tea loaded with 9 Botanical herbs will help anti-aging benefits. Modern lifestyle and environmental conditions are beginning to take their toll on our bodies. Even the fresh foods we buy and the water we drink has been treated with chemicals to make it sellable. The air we are breathing is laced with pollutants. Every day, we ingest so many forms of chemicals and toxic elements which your body struggles to deal with. And considering the hectic life that people live today, there just enough free time available to allow their bodies to detox and rejuvenate. 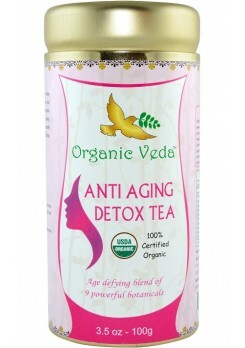 So Organic Veda came up with an amazingly beneficial solution – a powerful anti-aging Detox Tea Drink! This herbal tea can be the easy-to-adopt solution towards health and wellness that you have been searching for, all this time! Our anti-aging Detox Tea is loaded with 9 Botanical herbs will help anti-aging benefits. You can easily make it a part of your everyday lifestyle and this tasty detox tea will complement and supplement your body’s efforts in maintaining a healthy state of being. ✓ Organic Gotu kola leaf (Centella asiatica). ✓ Organic Liquorice root (Glycyrrhiza glabra). ✓ Organic Hibiscus rosa sinensis Flower. ✓ Organic Indian Senna leaf (cassia angustifolia). ✓ Organic Ginger Root (Zingiber officinale). ✓ Organic Stevia Leaf (Stevia rebaudiana). The proper organic blend of above Ingredients give the pleasant taste. It Containes NO Colour, NO Sugar, NO Preservatives, NO Gluten & NO Additives. Place 1 tea bag in a tea Cup. Pour boiling water (120ml) directly on tea bag. Infuse for 3 to 5 Minutes and Gentley Squeeze the tea bag to fully release the active ingredients. What more can you ask for! 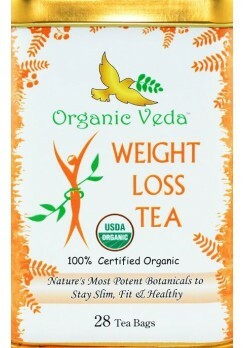 Order your bag of wellness today – Organic Veda’s 100% organic herbal tea for anti-aging - 28 tea bags (each 2g).